When you lose a tooth (through decay or injury) you require an immediate treatment to fill the new gap. It is not only important for cosmetic and aesthetic reasons, but it is also important for the health of your gums and bones. There are different methods of filling these gaps. 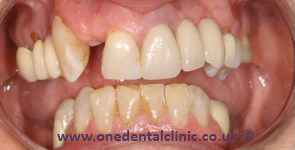 One method is having a denture which can be a temporary or removable solution. The other more stable and permanent solution is a dental bridge. The dental bridge, as the name suggests, is actually a replica of your natural bridge (found in the mouth), as it requires two supports on either side of the missing tooth. This bridge covers the gap with the help of supports. In between these supports is the false tooth, which fills the place of a missing tooth. The dental term for this is a pontic. In some instances, a Maryland bridge may be used. In this procedure, wings are fixated to the teeth on either side of the gap. 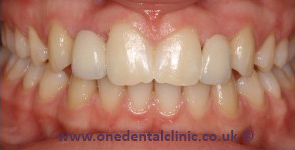 The advantage of this method is that the two teeth on the sides of the gap do not need to be fitted for a crown. 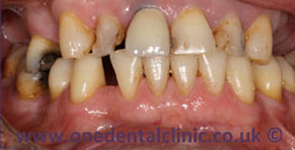 This patient was unhappy with the appearance of his front teeth. Crowns and bridges were used to improve the aesthetics and function of his teeth. This patient had missing teeth from birth. 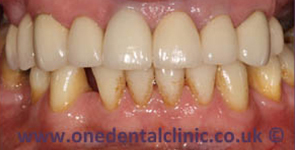 We used Maryland adhesive bridges to fill in the gaps in two simple visits. 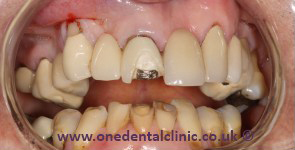 This patient was unhappy with gap between her front teeth. A Maryland Adhesive bridge was used to improve the aesthetics and function of her teeth. 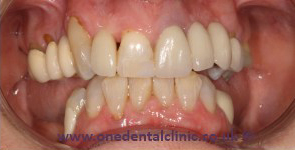 These are the standard bridges that include an abutment tooth on both sides and pontic filling in-between. Normally the tooth and crown are made from porcelain. This type of bridge uses wings (made of metal) on either side of the false tooth to securely hold it in position. 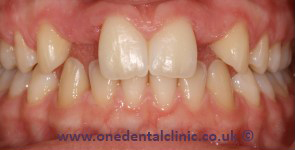 If the false tooth is supported only on one side of the bridge, it is known as a cantilever dental bridge. How Do You Know If A Dental Bridge Is The Best Treatment For You? Visit us at One Dental Clinic for a free consultation. We will look at your problem and will find out what is required to be done. If a bridge is required for your case, we will prepare a treatment plan with all your suitable options listed and will answer any questions you may have. After the treatment plan has been accepted the abutments for the bridge will then be prepared. 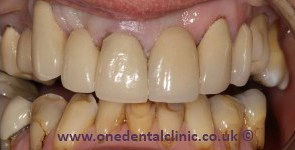 Before the dental bridge can be placed, the teeth either side of the gap will need to be crowned. The crowning will require a small portion of the tooth’s enamel to be removed to allow for the fitting of the crown. Impressions of your teeth will then be taken, ready to be sent to the dental laboratory for the bridge to be made. It will take a couple of weeks before your dental bridge is made but in the meantime we will fit you with a temporary bridge. Call us to arrange your free consultation today!